Brussels sprouts are one of thoese vegetables you either hate or love. If you hate it, I think you haven’t eaten it the right way yet. You can definitely create amazingly scrumptious dishes with this vegetable, which doesn’t have an outstanding flavor. You just need to know what other ingredients you should combine it with. This Tangy Brussels Sprout Salad is a result of such a perfect combination and has become one of our favorite quick salads to pair with any main dish. I claim that anyone with a strong bias against these miniature cabbages will change their mind once they try this tangy brussels sprout salad. Or Citrus Caramelized Brussels Sprouts with Pomegranates if they haven’t yet! I made it a while ago and I can say that it’s a real mind changer for those sprout haters! This one is yet another great salad that will make you love brussels sprouts. Unlike the citrus caramelized one, this brussels sprout salad is raw and shaved. And quicker. So what foods did I use to combine it with? Well, when I say tangy, I really mean it, so I used a good amount of lemon. I could have used a little Homemade Pomegranate Molasses too, but it didn’t just cross my mind on that day. I recommend you to drizzle a little over your salad if you have it in your pantry. I thought a little shaved red cabbage would make a nice addition with its lovely purple color and crunchiness. It did indeed! I’m in love with red cabbage and I use it very often, even at breakfast. I make a quick red cabbage salad for breakfast and it’s never enough. Is it weird to have such a salad in the mornings? You can’t know this before you try! Make your quick crostini with lemon rubbed red cabbage and a piece of feta in the morning. You will feel refreshed and start your day better! 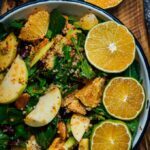 Besides red cabbage, I used grated carrot, orange slices, diced avocado and crumbled walnut in this tangy brussels sprout salad and I think they make one of the healthiest side dishes I’ve ever eaten! 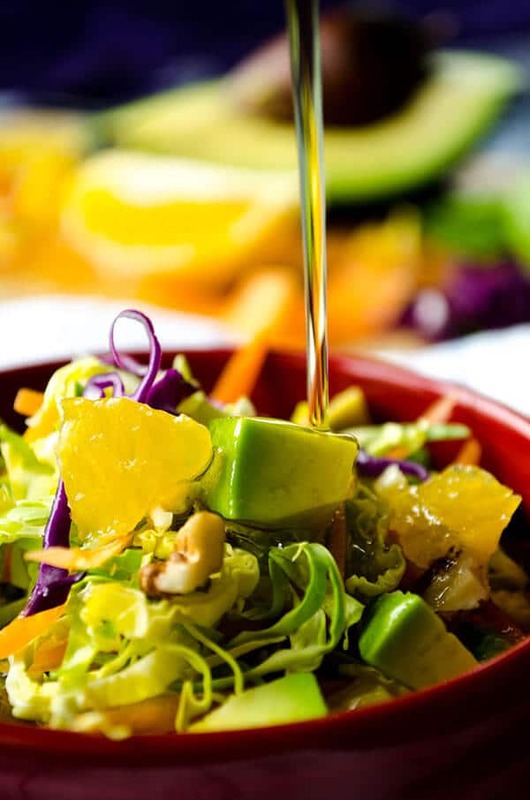 The oily flavor of avocado is very well balanced with juicy orange pieces in the salad. And they together go perfect with crunchy cabbages and grated carrot. Do I need to say what walnut pieces add to it? A healthy salad becomes even healthier and more nutritious with walnuts, right? This quick and healthy brussels sprout salad makes a good lunch too when you feel like eating something very light. A healthy and nutritious salad with brussels sprout, red cabbage, carrot, orange, avocado and walnut. Combine shredded brussels sprouts, red cabbage and carrot in a bowl. Sprinkle salt on it and pour lemon juice and mix well. Top with diced avocado and walnut. Drizzle extra virgin olive oil over it right before serving. You can chill it for half an hour if you have time. 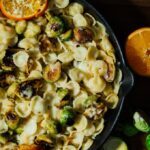 I was looking for a new brussel sprouts salad recipe, and came across this. I usually use a citrus vinaigrette, but love the idea of putting actual oranges in it.